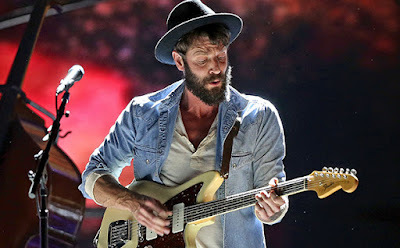 Discussions Magazine Music Blog: RAY LAMONTAGNE news! New album and tour with MY MORNING JACKET members! RAY LAMONTAGNE news! New album and tour with MY MORNING JACKET members! as touring band on upcoming 2016 North American Tour! (New York, New York) – Grammy Award winner Ray LaMontagne announces Bassist Tom Blankenship, drummer Patrick Hallahan, guitarist Carl Broemel and keyboardist Bo Koster (My Morning Jacket) as the touring band for his upcoming 2016 North American Tour. The band will join Ray on the 45 city tour will start in Cincinnati, OH on June 10th and culminate in Dallas, TX on September 24th. Ray stated, “I am very pleased to announce that the band for the upcoming “Ouroboros” Summer Tour will be Tommy Blankenship, Carl Broemel, Bo Koster, and Patrick Hallahan of My Morning Jacket. We’ve been throwing this idea around for quite a few years now, and the stars have finally aligned. There has been such positive spiritual energy flowing throughout this entire project. From that first restless night’s sleep when the album made itself clear to me, to the recording of the Album at La La Land Studio with Jim, to getting a call out of the blue ten months later that the Jacket boys wanted to back it up on the road. Fans who pre-order any version of Ouroboros from Amazon now through 11:59 PM PT on February 11th will receive an exclusive pre-sale code for early access to tickets for the upcoming tour. Those who received a code will be able to exclusively purchase tickets until 9:59 AM ET on March 3rd. Tickets to the general public will go on sale beginning March 4th. For more details on the tour, please visit www.RayLaMontagne.com. Ouroboros was produced by Ray and Jim James of My Morning Jacket. The album was written by LaMontagne and features first single, “Hey, No Pressure”. Click here to listen to “Hey, No Pressure.” NPR’s All Songs Considered called the track an “inspired new song,” stamped the album “incredible” and lauded that Ray “has continued to push himself in different directions.” Both the album and “Hey, No Pressure” hit #1 on Amazon’s digital best-sellers charts. My Morning Jacket's 7th studio album The Waterfall received a 2016 Grammy Nomination for Best Alternative music Album.